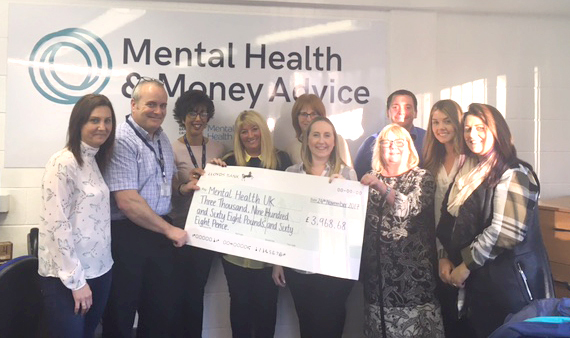 On Friday 24th November Lloyds Banking Group (LBG) presented a cheque for nearly £4000 to Mental Health UK following a Three Peaks Wales “virtual climb”. The climb was the equivalent of scaling Wales’ largest three mountains – Snowdon, Pen y Fan and Cadair Idris – totalling 17 miles! LBG has raised a significant amount of money for Hafal and its partners in the Mental Health UK network – Rethink, Support in Mind Scotland and MindWise – since partnering with Mental Health UK in January. Through this partnership LBG will work with Mental Health UK to create a pioneering Mental Health and Money Advice Service which will offer support for people experiencing both mental health and financial difficulties.